Night. It is Night. After Mad Maudlin comes into play, destroy all Day cards. Opponents must drive a character insane to resource a card, if able. Flavor Text: I went down to Satan’s kitchen, to break my fast one morning, and there I got souls piping hot, all on the spit a-turning. Hastur had only two ways to make it Night until now (San Servolo, Messenger from Hali). With the Opening Night conspiracy and Maud here, it will have 4. That being said, Hastur also benefits less from Night than, say, Shub. So what are we looking at ? 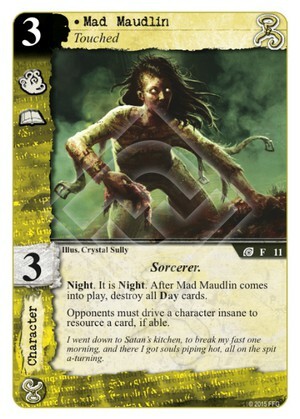 Well, stealing a lot more characters with "At Night they roam", suddenly having an incentive to play Sweet Dreams (and recur it with Patron) to crush opposing Mythos decks, seriously beefing up Fledgling Byakhee, activating the Whispers of Aoide condition... and helping your own Shub darkness-loving characters in a dual faction deck. Now for her second ability, it can be nasty of have no effect at all ("if able"...*sigh*), but at least it's permanent and free. Icons a bit on the weak side, skill OK... but she's such a cutie and wants to hug you so badly. 3/5.